Having confirmed his MotoGP™ future for 2014 a day earlier, Moto2™ championship leader Scott Redding has set the pace in Silverstone’s opening practice session on Friday morning. 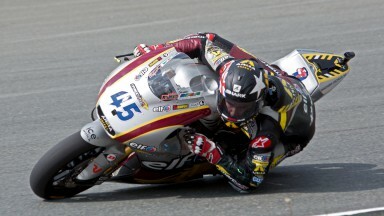 The Marc VDS Racing Team rider led the way from title rival Pol Espargaro and Switzerland’s Dominique Aegerter. It was Aegerter (Technomag carXpert) who topped the timesheets for much of the session, but Redding moved ahead in the final moments courtesy of his 2’09.034 lap time; this edged out Tuenti HP 40’s Espargaro by just fifth hundredths of a second. Behind Aegerter, the top five was completed by Came Iodaracing Project’s Johann Zarco and Espargaro’s teammate Tito Rabat. Incidentally, on Thursday it was confirmed that Redding will next season make his premier class debut, riding a Honda ‘production racer’ for GO&FUN Honda Gresini. Tech3’s Danny Kent was the leading British runner in sixth place, just ahead of Redding’s teammate Mika Kallio who won at Brno in the Czech Republic last weekend. During the opening minutes of the session, there was a multiple collision at Vale corner as Rafid Topan Sucipto (QMMF Racing Team) ran into both Tech3’s Louis Rossi and Technomag carXpert’s Randy Krummenacher. Rossi visited the Medical Centre complaining of leg pain, but would soon rejoin the track action. Following his crash at Brno, JiR Moto2’s Mike di Meglio remains on the sidelines and is being substituted for this weekend by Australia’s Jason O’Halloran. 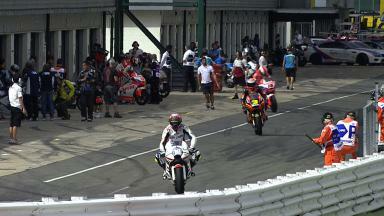 The second Silverstone Moto2™ practice session will commence at 3:05pm local time (GMT +1).